Several elderlies remain independent even there are several challenges that they have to face each day, including protecting themselves from the property, nonfatal, fatal violence. The fact that there are 3.6 per 1000 elderlies that are victims of nonfatal violent crimes, 72.3 per 1000 elderlies that are victims of property crimes, and 59 percent are reported victims of violent crimes, leaving them alone living independently without a security system is putting their lives at risk from this violence. Why Choose Medical Alert Systems? Medical alert systems are not only used for medical emergencies, but it is also a perfect choice to keep the elderlies safe from possible crimes when living alone or with a caregiver. Here are the top reasons why medical alert systems can keep the seniors from criminal minds. 1. It can keep the elderly safe real-time. 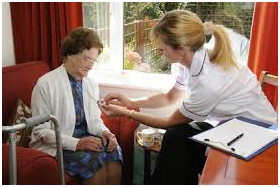 · You are able to detect if the paid caregiver is hurting your elderly parents. · To scare away possible robbers from breaking in. There is something about alarms that keeps them from pursuing their criminal acts. · To see if your parents are doing fine while they are enjoying their independence. 2. You are notified if someone comes in and out of the house. Using medical alert system integrated with a home security system enables you to receive notifications when someone is coming in and out of the house, especially keeping an eye on your paid caregiver movement. The fact that there had been several reports about caregivers stealing from their clients, you do not want to miss out adding a burglar alarm to your current medical alert system package. Most medical alert systems are equipped with wearable devices. So, wherever they are within the house, you can guarantee their safety; with just one push of a button, they can easily contact or alert an emergency representative in case of an emergency situation. If in case the elderly is experiencing violence from his or her caregiver, he or she can easily ask for help by pushing the button of their wearable device. In fact, its portability is one of the most highlighted advantages that you can read in some medical alert systems reviews. Seniors are one of the most vulnerable groups in the society. However, no one can stop them if they want to feel their independence. The only way we can keep them from scary neighborhood or from violent caregivers is to provide them with medical alert system integrated with security home system, where you are able to watch them in real-time and be notified in case of an emergency.